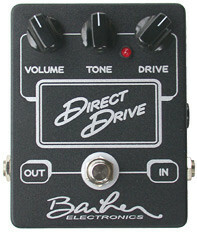 The Direct Drive provides guitar players with classic amp tones! True to life overdrive with greatly reduced compression artifacts, this unit has it all, clarity, great guitar volume knob control, solid punchy articulate bass, gain range from a little juice to fat harmonic overdrive. Give your guitar playing a vintage voice with this stellar performer! 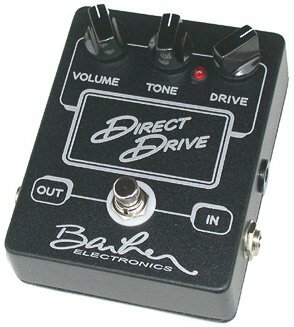 Internal bass control - The Direct Drive can dial in a stronger deeper bass response to perfectly match amplifiers. Adjustable presence circuit - The internal presence circuit allows the Direct Drive excellent clarity while limiting fizzy artifacts. True bypass switching with led indicator - this is achieved by using an high grade switch, in addendum Solid 20 gauge copper hookup wire is used between the jacks and switching to create an exceptional bypass. The Direct Drive operates from 9 volts to 18 volts, this allows use of higher voltage converters and supplies, for players who want to try higher voltage tweaks.